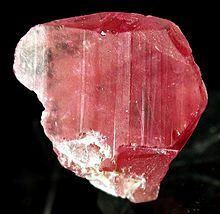 In mineralogy, silica (silicon dioxide) SiO2 is usually considered a silicate mineral. Silica is found in nature as the mineral quartz, and its polymorphs. On Earth, a wide variety of silicate minerals occur in an even wider range of combinations as a result of the processes that have been forming and re-working the crust for billions of years. These processes include partial melting, crystallization, fractionation, metamorphism, weathering, and diagenesis. Living organisms also contribute to this geologic cycle. For example, a type of plankton known as diatoms construct their exoskeletons ("tests") from silica extracted from seawater. The tests of dead diatoms are a major constituent of deep ocean sediment, and of diatomaceous earth. 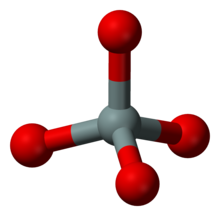 A silicate mineral is generally an ionic compound whose anions consist predominantly of silicon and oxygen atoms. In most minerals in the Earth's crust, each silicon atom is the center of an ideal tetrahedron, whose corners are four oxygen atoms covalently bound to it. Two adjacent tetrahedra may share a vertex, meaning that the oxygen atom is a bridge connecting the two silicon atoms. An unpaired vertex represents an ionized oxygen atom, covalently bound to a single silicon atom, that contributes one unit of negative charge to the anion. Nesosilicates isolated silicon tetrahedra [SiO4]4− olivine. Sorosilicates double tetrahedra [Si2O7]6− epidote, melilite group. Cyclosilicates rings [SinO3n]2n− tourmaline group. Inosilicates single chain [SinO3n]2n− pyroxene group. Inosilicates double chain [Si4nO11n]6n− amphibole group. Phyllosilicates sheets [Si2nO5n]2n− micas and clays. Tectosilicates 3D framework [AlxSiyO(2x+2y)]x− quartz, feldspars, zeolites. Note that tectosilicates can only have additional cations if some of the silicon is replaced by an atom of lower valence such as aluminium. Al for Si substitution is common. 4. The grey ball represents the silicon atom, and the red balls are the oxygen atoms. Note that the ring in axinite contains two B and four Si tetrahedra and is highly distorted compared to the other 6-member ring cyclosilicates. Phyllosilicates (from Greek φύλλον phyllon, leaf), or sheet silicates, form parallel sheets of silicate tetrahedra with Si2O5 or a 2:5 ratio. The Nickel–Strunz classification is 09.E. All phyllosilicate minerals are hydrated, with either water or hydroxyl groups attached. 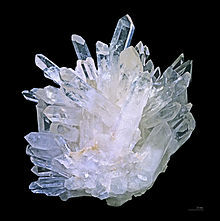 Silica family (SiO2 3D network), β-quartz. The 3D aluminosilicate anion of synthetic zeolite ZSM-5. ^ "Mineral - Silicates". britannica.com. Archived from the original on 25 October 2017. Retrieved 8 May 2018. ^ Deer, W.A. ; Howie, R.A.; Zussman, J. (1992). An introduction to the rock-forming minerals (2nd ed.). London: Longman. ISBN 0-582-30094-0. ^ Hurlbut, Cornelius S.; Klein, Cornelis (1985). Manual of Mineralogy (20th ed.). Wiley. ISBN 0-47180580-7. ^ Deer, W.A. ; Howie, R.A.; Wise, W.S. ; Zussman, J. (2004). Rock-forming minerals. Volume 4B. 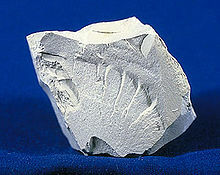 Framework silicates: silica minerals. Feldspathoids and the zeolites (2nd ed.). London: Geological Society of London. p. 982 pp.